Traditional Japanese calligraphy is called Shodo. The origin of shodo is from China, and introduced to Japan about two thousand years ago. It is an art that has been studied. 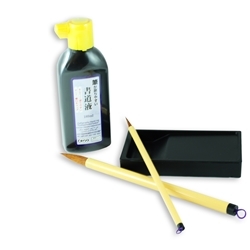 Tools of Shodo are Japanese traditional stationery. The knowledge of Shodo is an important step in understanding of Japanese culture. Shodo is not only an exercise in good handwriting, but rather the foremost art form. It is a combination of the skill and imagination of the person using only lines. Styles are highly individualistic, and differing from person to person. Characters must be written only once. There is no altering, touching up, or adding to them afterwards.